Something Delightful : Attention Lilly Lovers!! Today, Rue Lala has some GREAT buys on Lilly Pulitzer! It seems to only be small sizes (x-small, small, 00, 0, 2) left, but it's definitely worth checking out! 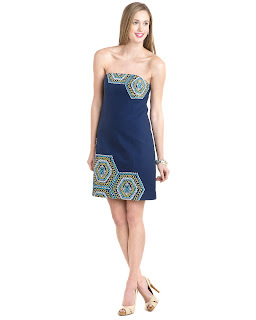 I just ordered the "Bowen" Bright Navy Honeycomb Home Strapless Dress. It's only $49.99! It will be great for going into Fall. I didn't get anything, but I LOVE the dress you picked up!